On Your Marks, Get Set…Blow! 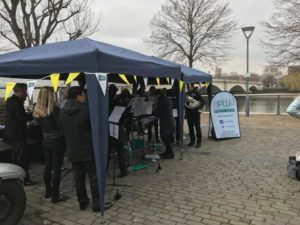 As the crowds flocked to the riverfront for arguably the biggest highlight of the Putney calendar – the University Boat Race – the rowers weren’t the only ones testing their lungs that day. Spectators had the pleasure of Putney & Wimbledon Brass Band to entertain them in the moments between the races. It might have been the battle of the Blues but we were there in our classic green, to play a mixture of some Brass Band classics such as The Floral Dance and old pop favourites like Grease, Abba and Bohemian Rhapsody. The crowds loved it, as did we. We’d like to thank Positively Putney for inviting us and we look forward to working with them again in the future. We’re now busy getting ready for the summer, so watch this space to find out more about our upcoming events!